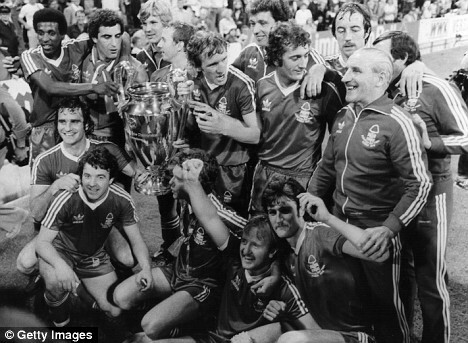 30 | May | 2009 | Through the seasons before us..
Memories of glory, and a reality check..
Around this time thirty years ago Nottingham would’ve been a great place to be – Munich would’ve been a better place to be, of course, because Forest would have just been crowned Champions of Europe. You know, back when you really had to be a Champion to qualify for the competition. There’s been lots of reminiscing around the internet which I’ve been keeping tabs on – sadly being of a certain age I have no recollection at all of those legendary events, although of course have become as familiar as one can with them in retrospect from videos and stories from my elders. It’s certainly a story worth telling, I reckon! I’m sure you’ve seen numerous pieces yourselves, but my favourite by far has been Gary Roe’s five part recollection of the Annesley Reds and their tour to Munich. Released over five days in installments over on LTLF, it’s made essential daily reading for me – incase you haven’t already caught it, then I’ve provided a link below – a great account! Hats off to you, Gary – a thoroughly enjoyable read! There is also an interesting alternative account on LTLF courtesy of ‘Me Owd’ whose general recounts of past glories or players I would recommend reading too. You can find this by clicking here. Whilst we lose ourselves in misty reminisces of glory, we should also spare a thought to the awful news that Nottingham lad and Forest fan Lance Corporal Kieron Hill of the Mercian Regiment was killed in the Helmand Province, Afghanistan on 28th May. Kieron leaves behind two brothers, one of whom is in the Forest academy, another on the books of neighbours Notts County. I’m sure you’ll all join me in offering condolences to his family and friends. Rest in Peace, Kieron.